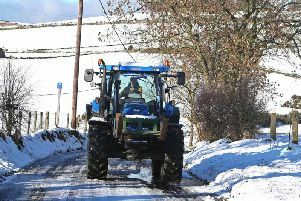 Parts of Londonderry became flooded after a heavy snowfall was followed by a fast thaw. Various parts of the city were affected, and the River Faughan burst its banks overnight along Fincairn Road. The Belfast-bound train makes its way under the Peace Bridge early on Wednesday morning, captured from Austins rooftop. As day dawned, the river was again contained by the banks but the overnight damage was still clear to be seen, as shown in this video taken by a resident. The Mobuoy area was particularly badly effected with the road being closed to traffic all day after two vehicles became stuck. In that area, where Faughan Valley golf club is situated, the river raged across fields and part of the road, flooding other fields beyond.